Map's missing the lake that I labeled as Lake Baikal, but Ovi should know about the details. Yeah, I'll send him the file once I finish my map. Should be a simple fix. Oh, yeah! Ovi and I are working with two separate files on two different projects. I'll merge them up again in a little while when we're each done. So then, that's our opening to discuss rules and whatnot. So is our focus still going to be on that one island? 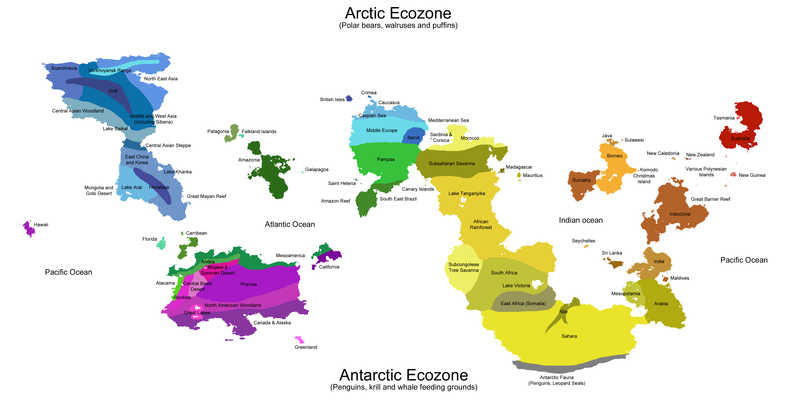 Do we spread people around the map in Proliferation then zoom back on that island for Domestication? I thought that for a time that our humans would be confined to that island until they figure out a way to get off of it. It took humans 100,000 years to make it out of Africa, for instance. And from a gameplay perspective, it'll give us some time to beta test the systems and tweak stuff before spreading out too far and making giant mistakes. What I have in mind with the little system for spreading the hew-mons is that we don't need to set an arbitrary time to shift into the next phase. Turns will represent a certain length of time, and however many turns it takes for humans to develop enough population and technology to make settlements that's how long it takes. Humans in PDP:CW world might take a lot less time to build the first settlement, or a lot more. So, I've finished the region boundaries. There are 247 land regions (more than I anticipated, but I think it works). I'm not 100% set on the ocean regions, so feel free to open these up in Google Earth to see what they look like in there. Speaking of which, I've completely revamps the Google Earth file to include all the things (and hopefully some of the layers will load a bit faster). I've named every land region using the Greek alphabet as the landmass names (I define each landmass as each area of contiguous continental shelves) from largest to smallest (see left side of image below), and then a number. 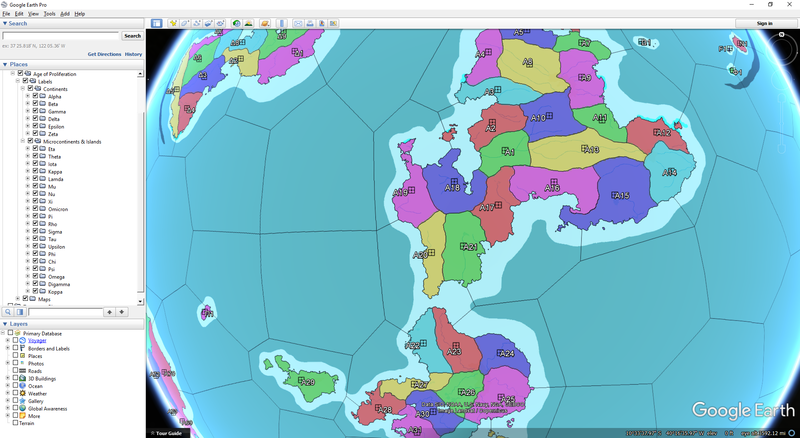 Obviously as we play, these landmasses will get real names, but this should work for now. I haven't named any of the water regions yet as I wanted to get some input on how they look before I finalize them. And, speaking of the Google Earth file, it's nearly ready, just need to get with Pat to combine our two versions of the GIMP file so I can get a biome layer in there. Digamma Troi was my favorite character on TNG. When I grow up, I want to be a wizard like Ovi. Aw hell now they know I'm actually paying attention. I made some minor changes. Nothing big, but it satisfies my perfectionist itch. Added "Various polynesian islands" to the australasian sea. I'm too lazy to label every one of those. You can figure it out. I mean, the fauna and flora should be fairly homogenic anyway. Added a little strip of Middle Europe to separate Iberia from Caucasus. This also means that Middle Europe now touches the mediterranean coast. Imagine those parts to equal Italy and Greece in terms of ecozone. Looks like you guys have been busy. I am sad to see no Easter Island on the map. Otherwise it looks cool! Well, there is a "various Polynesian islands" area. That being said, because of the rampant devastation of the biosphere there, a lot about what we know about the island before humans arrived comes only from fossil evidence (and there really isn't a that much to make it special).